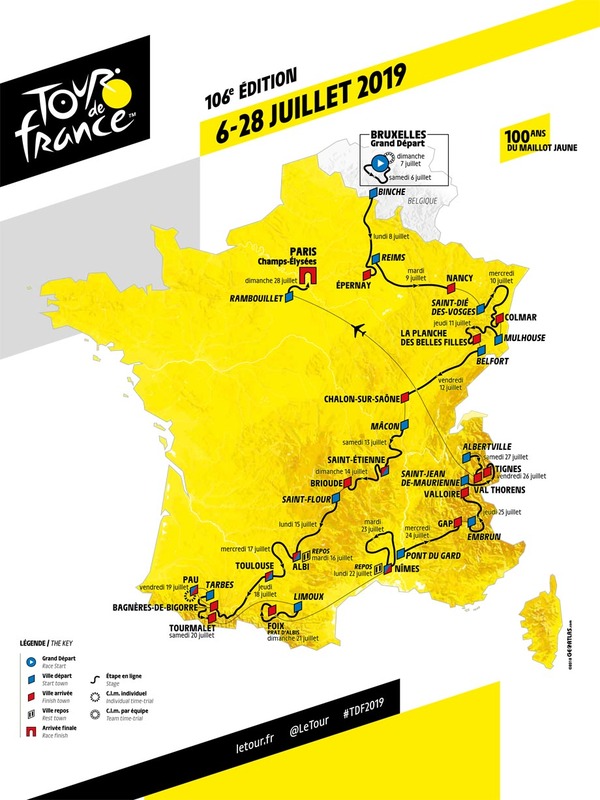 PezCycling News - What's Cool In Road Cycling : Le TOUR 2019: The Full PEZ Route Guide! 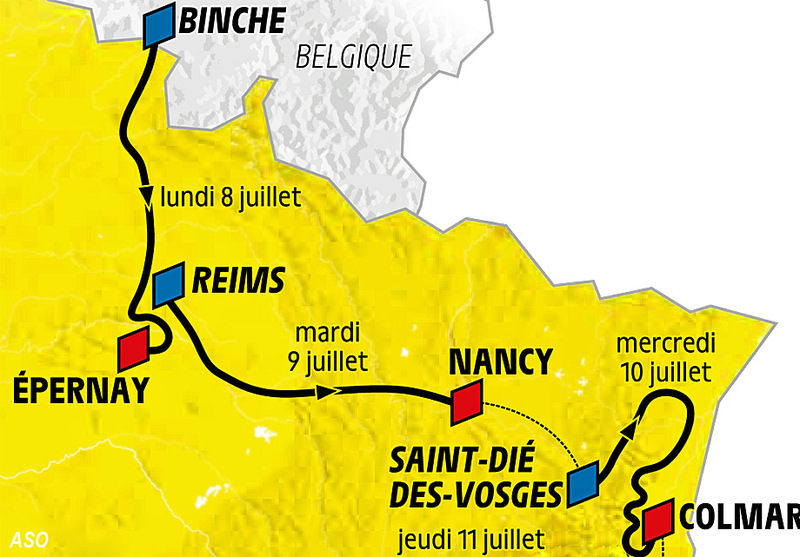 Le TOUR 2019: The Full PEZ Route Guide! 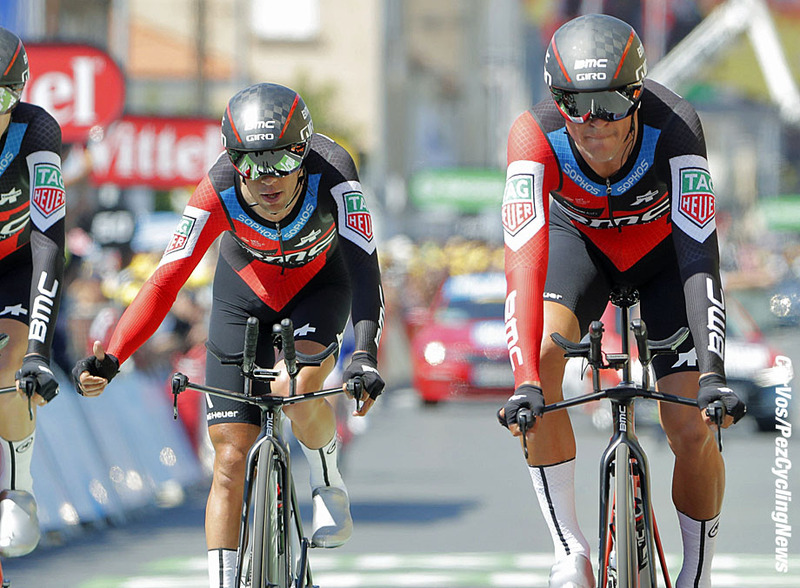 Race Preview: The Tour de France route is always eagerly awaited by riders and fans alike. The Tour 2019 parcours have been designed for the climbers with only 27 kilometers of individual riding against the clock. The sprinters do get a look-in with half a dozen opportunities, but with five summit finishes the anti-gravity boys have the advantage. Here is the PEZ stage-by-stage break-down of the 2019 French Grand Tour. 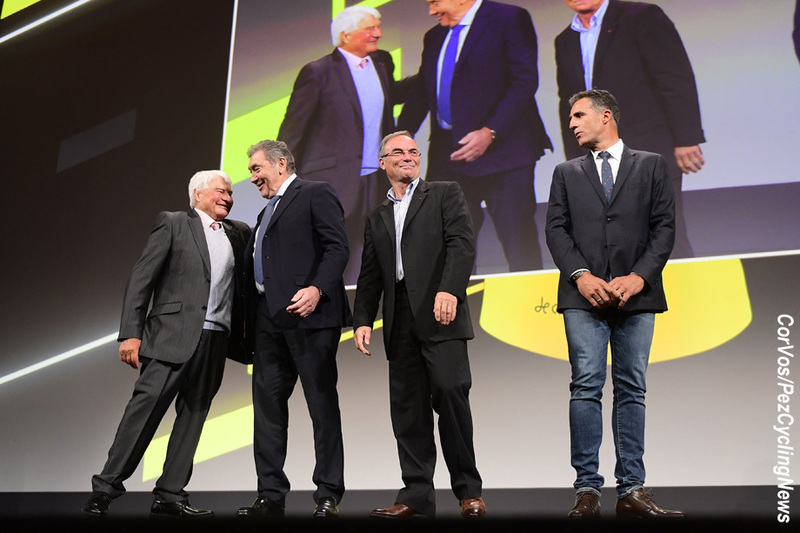 The 2019 Tour de France route was presented on Thursday morning to a star studded audience in the Palais des Congrès convention centre in Paris. The 106th edition of the French Grand Tour covers 3,460km and celebrates 100 years since the introduction of the yellow jersey. The Grand Départ from Brussels honors the 50th anniversary of Eddy Merckx’s first yellow jersey, with two stages in the Belgian Capital - A 192 kilometers road stage starting and finishing in Brussels and a team time trial. From Belgium the race moves South through Northern France before hitting the climbs of the Vosges Mountains and the Massif Central. Three mountain stages and a 27 kilometer individual time trial in Pyrenees before the big final week showdown in Alps. Three very hard Alpine stages before the final sprint in Paris see the peloton battle over the Col du Télégraph, Col de Vars, Col d’Izoard, the Galibier, Col du Lautaret, Tignes and the Col de l’Iseran. 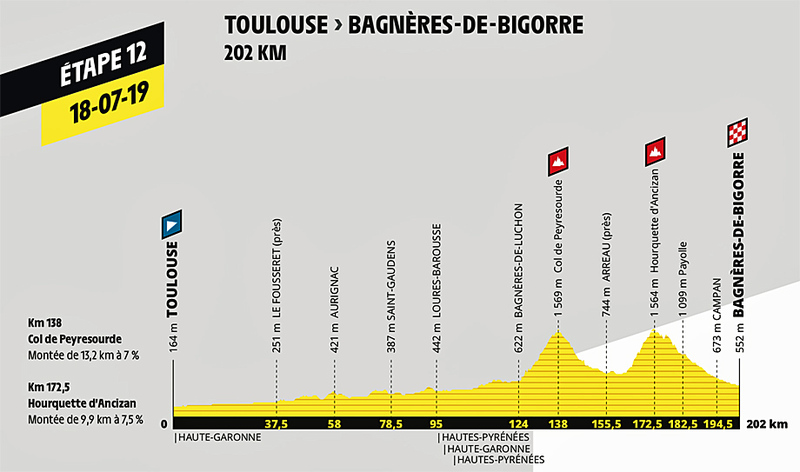 On the decisive stage 20 from Albertville; the summit finish in Val Thorens comes at the end of a torrid 33.4 kilometer climb, all this after the Cormet de Roseland and the Côte de Longfoy. 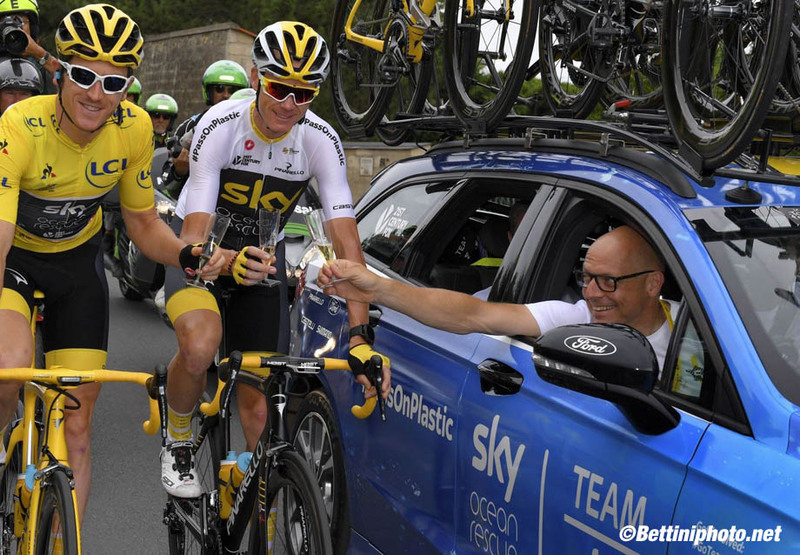 Froome or Thomas for Sky in 2019? A flat stage starting and finishing in Brussels with a probable sprint for the first yellow jersey. 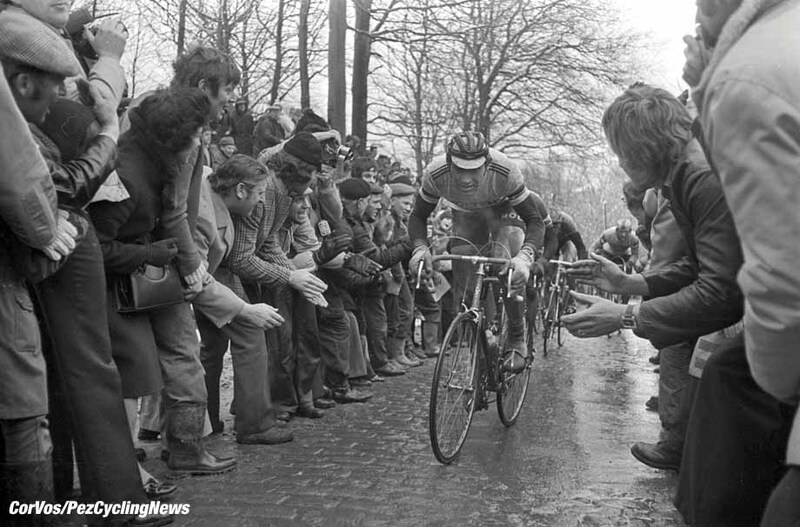 The stage takes in the Muur van Geraardsbergen which was on the course of Eddy Merckx’s first Tour in 1969. The race makes its way back to Brussels from Charleroi to pass the Butte du Lion field, the site of the battle of Waterloo. Then through Woluwe-Saint-Pierre where Eddy Merckx grew up in his parents grocery store. The 28km team time trial should cause a reshuffle on the overall standings from stage one. The finish will be in the shadow of the Atomium, built for the 1958 Universal Exhibition. The Tour leaves Belgium for Northern France with a hilly parcours on stage three. A sequence of hills in the final 30 kilometers, including the Côte de Mutigny, could launch a victorious attack before the finish in Épernay. Or the stage could end in a bunch gallop if the sprinter's teams hold the race together. Epernay was the finish of stage 1 of the 50th edition of the Tour back in 1963. That first race day was marked by the crash of title holder Jacques Anquetil and a decisive move from Federico Bahamontes. Belgian Eddy Pauwels won the stage and Bahamontes had a lead of 1:30 over his main rivals. 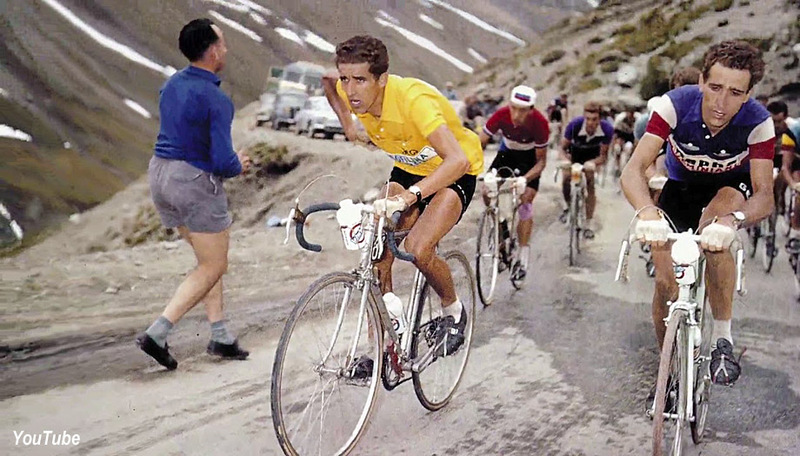 Bahamontes eventually took the yellow jersey on stage 16, but the next day Anquetil won the stage to Chamonix and held the overall lead to Paris with KOM Bahamontes second at 3:35 and fellow Spaniard José Perez-Frances in third place at 10:14. A day for the sprinters in Nancy on stages four, this will be similar to stage 7 of the 2014 Tour that Pez himself covered through some historic battlefields of WWI. Nothing should prevent the fast-finishers fighting it out on the 1.5km final straight. The first hilly stage with a terrain suited to a strong breakaway. The 169 kilometers to Colmar has numerous climbs in the final 50km, like the Côte des Trois-Épis. If a break doesn't succeed then an Ardennes style rider could attack before the flat finish. The first mountain stage with a summit finish to La Planche des Belles Filles, but with an extra sting in the tale with a kilometer of dirt road with a 20% ramp. The 5.5km climb’s steep slopes have seen some memorable battles in recent years; Chris Froome respond to a Cadel Evans attack on the steepest part of the climb. 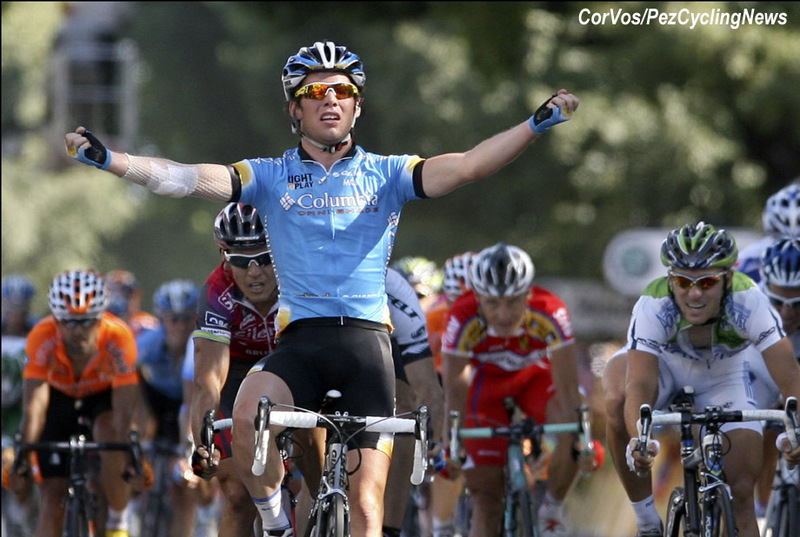 That day in 2012 Sky took the double: stage for Froome, yellow for Wiggins. Two years later Vincenzo Nibali won in his Italian national champion’s jersey after Alberto Contador crashed out on a wet descent (the PEZ was roadside for that one too), Fabio Aru copied his countryman in 2017. Before the finish in La Planche des Belles Filles, the race climbs the Markstein, the Ballon d’Alsace and the Col des Chevrères. The longest stage of the 2019 Tour de France will probably end in a bunch sprint. British cyclist, Brian Robinson, won here in 1959 after a long solo breakaway and the last time the Tour came to Chalon, Frenchman Thierry Marie managed to stay clear of the bunch in the final kilometer to claim his second Tour stage in 1988, so you never know. A lumpy day with many climbs on the roads through the Beaujolais vineyards. The Croix de Montmain, the Croix de Thel, the Croix Paquet, the Croix de Part and the côte d’Aveize for 3,800 meters of elevation. Saint-Étienne is where Bernard Hinault crossed the finish line with a fractured nose and a blood-stained yellow jersey in 1985. 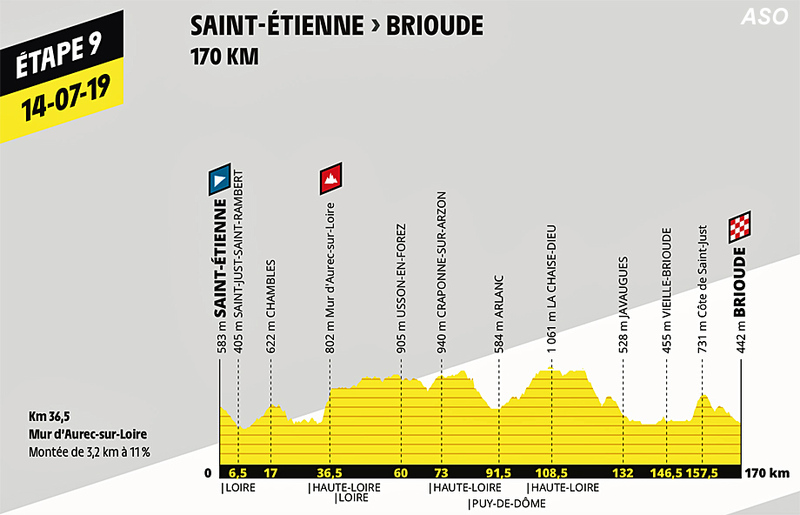 A tough day that could suit a breakaway or a final selection could be made on the Côte de Saint-Just, a 3.7km climb with an average 7.3% slope, 13kms from the finish at Brioude. Could suit a rider with a sprint who can get over the hills; Valverde or Sagan. Similar to stage 9, the day could go to a sprinter or a break. All of the stage is ridden at over 1,000 meters with climbs that will make it hard to control the race. 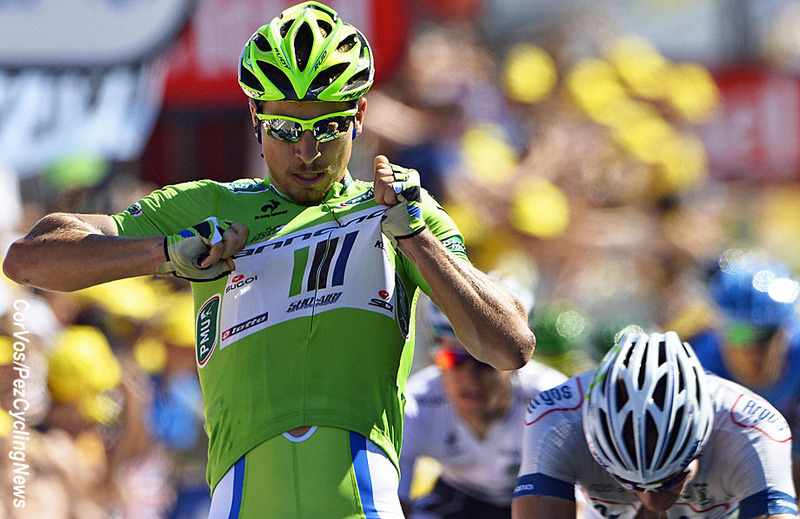 Peter Sagan won the last time the Tour came to Albi in 2013, it would be three years until the Slovakian would win another Tour stage. ASO: "The prefecture of Tarn was voted “most sporting city of France” in 2012 by newspaper L’Équipe and that was just after being added to the UNESCO World Heritage list for the majesty of its Sainte-Cécile cathedral, described as the largest brick building in the world." After the first rest day, the peloton heads towards the Pyrenees with two transition stages. There is a high possibility of a sprint finish in Toulouse, but it will be a tough job for the teams to control the race. Toulouse was a Tour town in the first 'Grande Boucle' of 1903, then in 1908, Lucien Petit-Breton won a stage there before conquering his second Tour as did Gino Bartali in 1948. 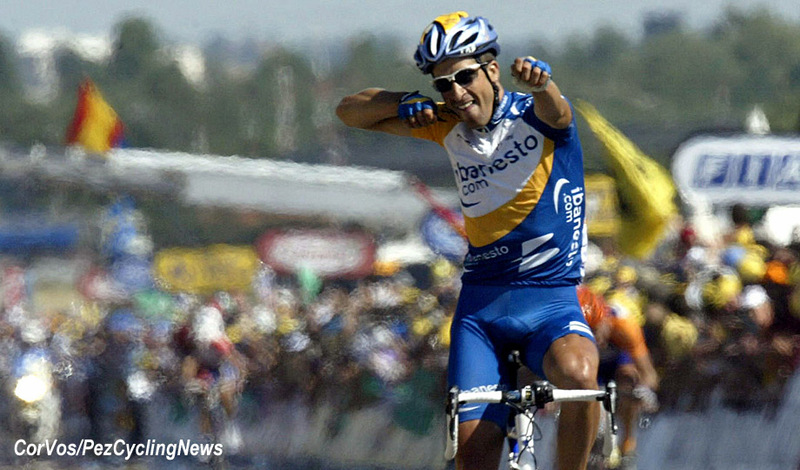 More recently Juan-Antonio Flecha won solo in 2003 and Mark Cavendish in a sprint in 2008. Stage 12 will be the toughest stage so far, climbing the Col de Peyresourde and the Hourquette d’Ancizan before the descent into Bagnères-de-Bigorre. The best climbers should be together for the drop into Bagnères-de-Bigorre. At 27km the stage 13 time trial is not long, but the hilly test could prove crucial. 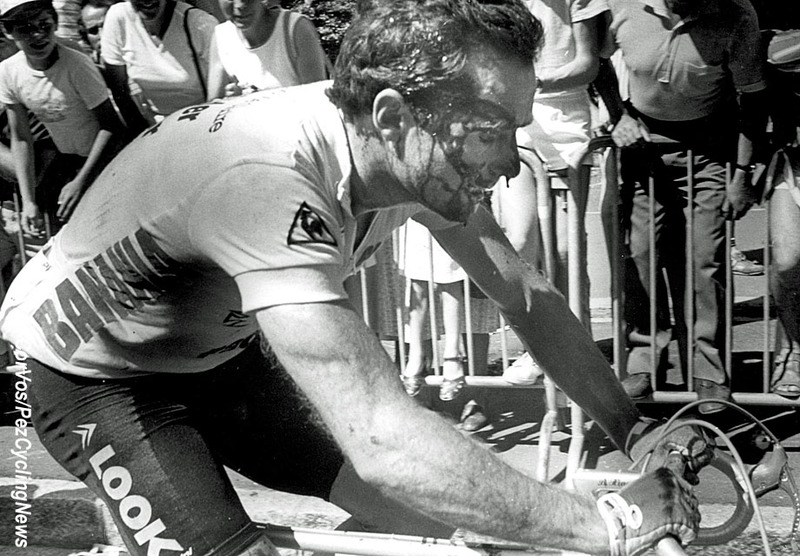 Bernard Hinault won the time trial in Pau on stage 6 in 1981, taking the race lead and holding it to Paris. A short stage at 117 kilometers with the Col du Soulor summit after 60 kilometers and high summit finish on Col du Tourmalet at 2,115 meters altitude. 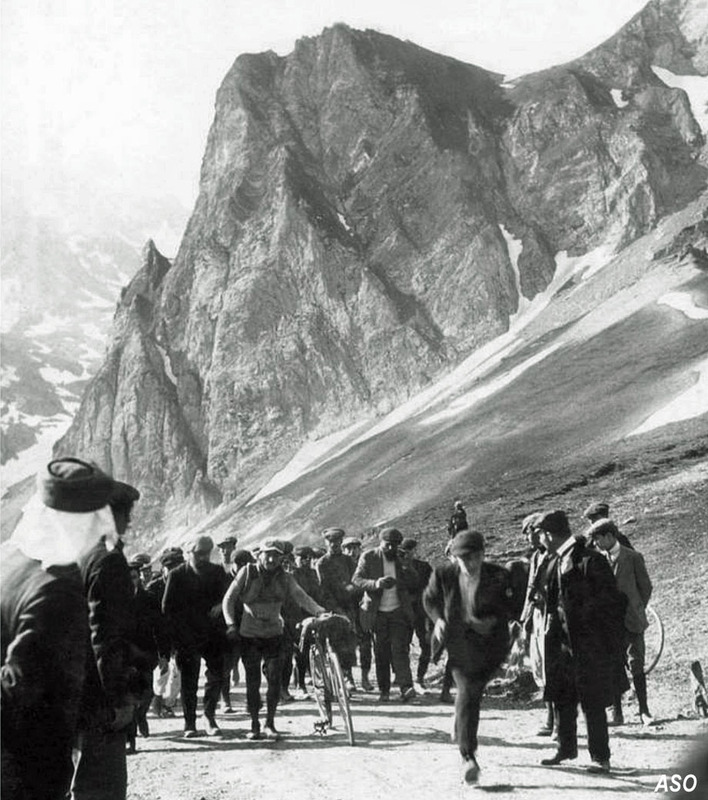 Octave Lapize was the first to the top of the Tourmalet when the Tour de France crossed the summit for the first time in 1910. Another hard day with a summit finish in Foix Prat d'Albis. 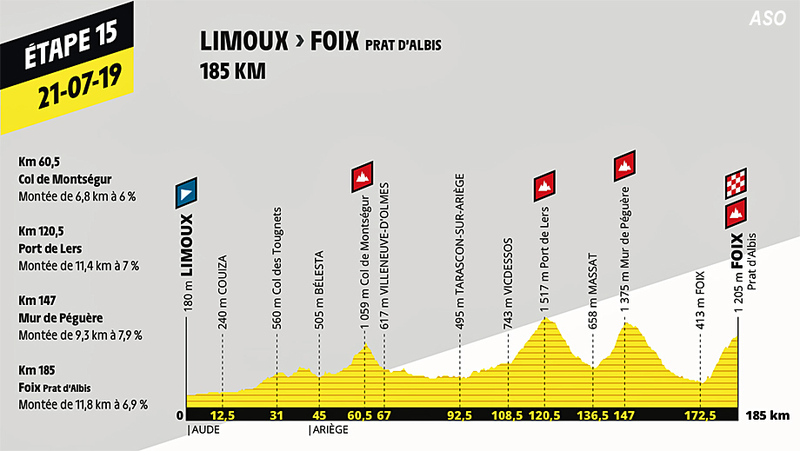 185 kilometers with three climbs, including the Côte de Montségur before the finish at Prat d’Albis; a 12 kilometer climb at an average of 6.9%. A total to 4,700 meters of climbing. Second rest day in Nîmes and the Tour heads for the Alps for the finalé. ASO: "The prefecture of Gard is part of the cities that have a history of over a hundred years with the Tour that came in 1905. Other than the Tour, the Roman city has also welcomed the Grand Départ of the Vuelta in 2017 and quite a few stage finishes of the Grand Prix du Midi Libre." 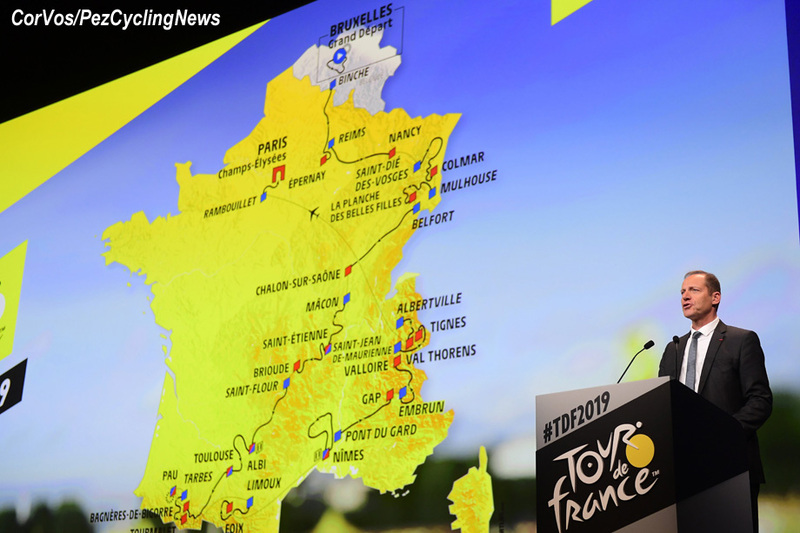 Two sprint stages on stage 16 and 17 will take the peloton to the start of the Alps and the climax of the 2019 Tour de France. In 2008, Nîmes discovered the spectacular sprinting qualities of Mark Cavendish and became the fourth of the 26 French towns where the British rider captured victory. Another sprinter would win there six years later just by the famous arena: Alexander Kristoff claimed his second stage success after an exciting stage that saw Jack Bauer caught by the pack with just 20 meters to go. 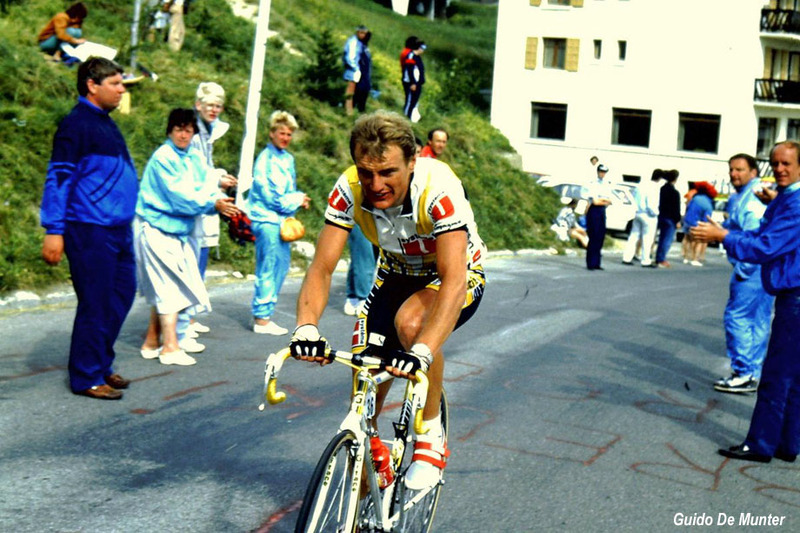 Long distance attackers often met success in Gap like Jean-François Bernard for his first victory in 1986 or Pierrick Fédrigo twenty years later. After that, finishes in the city crowned a World Champion in 2011, Norway’s Thor Hushovd and two years later, a man who would go on to carry the rainbow jersey, Portuguese rider Rui Costa. For the last visit of the Tour in 2015, the successful breakaway hero Ruben Plaza. 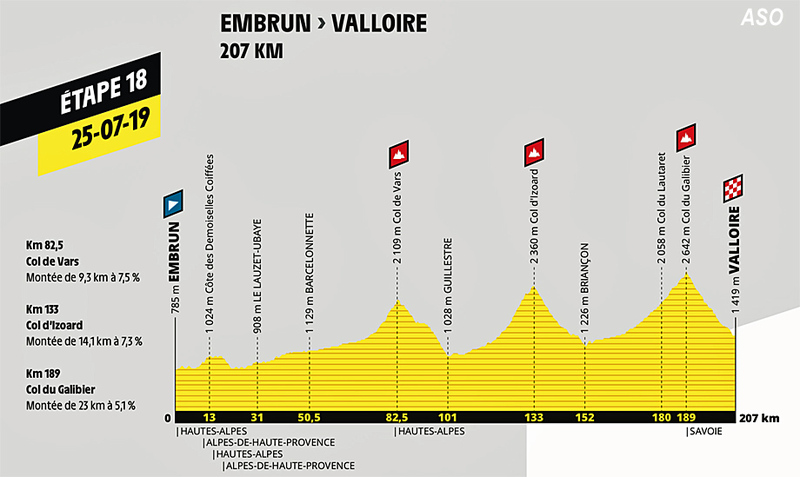 The race heads into the Alps for its first grueling day of 207 kilometers that climb the Col de Vars (2,109m) and the Col d’Izoard (2,360m) before dropping down to the town of Briançon. They then cross the summit of the Galibier (2,642m) via the Col du Lautaret, before descending to the finish in Valloire. 1972 saw the victory of Eddy Merckx in the yellow jersey on a half-stage. Luis Ocaña was suffering with a chest complaint and lost time and so fourth title for the Belgian champion was on the horizon. 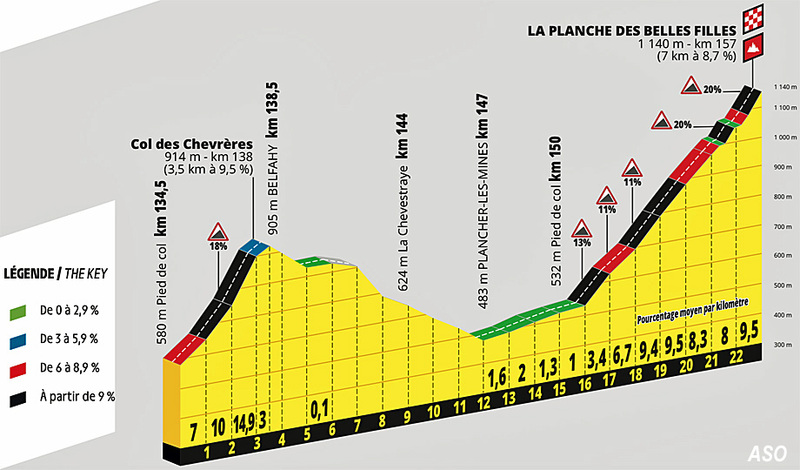 The second Alpine day is a short 123km stage with three categorised climbs before the summit finish in Tignes (2,089m). But first there is the Col de l’Iseran (2,770m) before the final summit. The Col de l’Iseran will only be climbed for the eighth time in the history of the Tour and the second time from south side which is the toughest one. Louison Bobet bid farewell to the Tour in 1959 when climbing the highest road pass in Europe in this direction, and also where Claudio Chiappucci took off before winning in Sestrières in 1992. 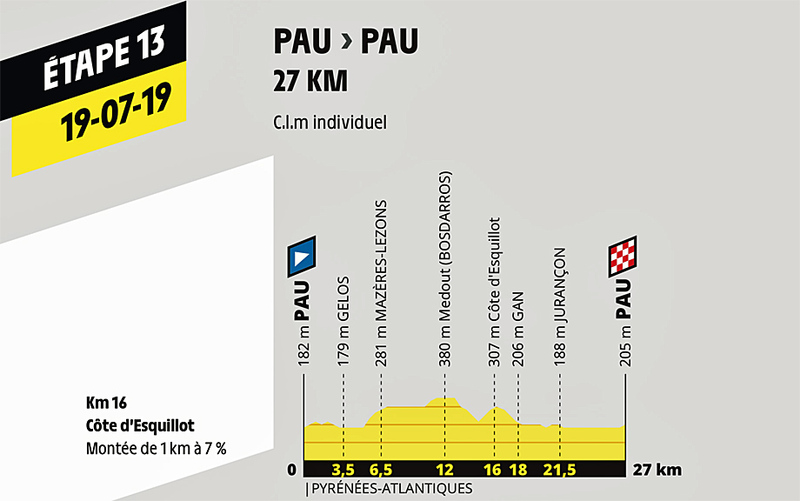 The last battle of the 2019 Tour begins in Albertville and ends with a summit finish in the ski resort of Val Thorens (2,365m). 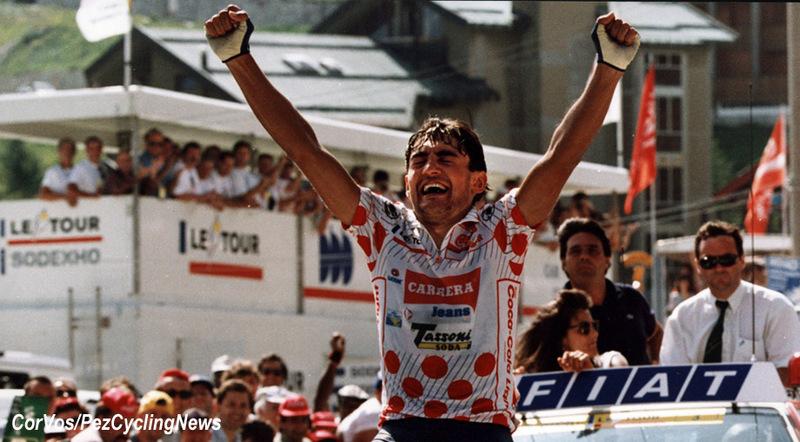 The long 33.4km climb to Val Thorens has only been used once before, in 1994, on that day Nelson Rodriguez of Colombia won, the climb is not so steep, but is very long. 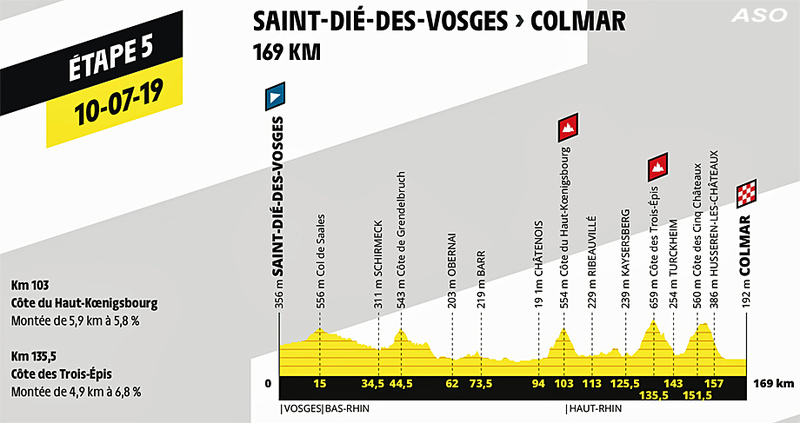 There are two climbs before the monster to Val Thorens; the Cormet de Roseland (1,968m) and the Côte de Longfoy (1,190). 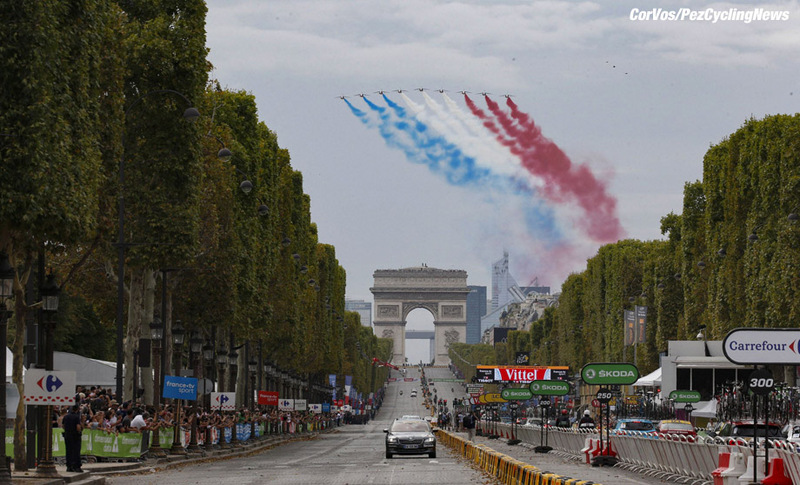 After the action in the Alps, the ride from Rambouillet to Paris for stage 21 will be the usual photos and champagne before the sprint on the Champs-Élysées. Stage 19: col de l’Iseran. Stage 21: Sunday, July 28 Rambouillet – Paris (Champs-Élysées) 127km.